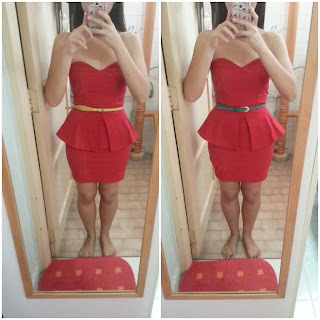 Been looking for a peplum dress for really long. Once I saw the preview, I was almost certain i was going to get it! Couldn’t quite decide on the colour again. Black – boring me again! Blue – I have quite a lot of it. Fuchsia caught my eye during the launch, and my friend advised me not to get white. So, it was Cobalt in the end since I didn’t want black. When I took it out of the bag, I was already super happy. Love the rich cobalt colour and the stretchy material. Put it on and fell in love with it. Due to the material and cutting, it really hugs the curves and shows off the waist. I have big hips and thighs, so I do feel that it hugs a bit too close for comfort at the bottom for me – but nothing major. M fits me just nice, with little allowance. 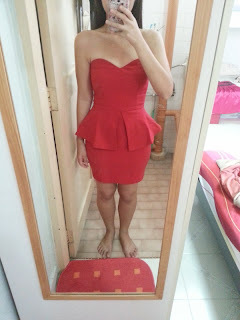 The heart shape neckline is really sweet and the peplum hides the tummy! Comes with anti-slip. There’s also a thick inner lining. LB didn’t use the “invisible zips” for the zip this time – the problem with invisible zips is that it is really hard to zip the the joint sometimes! A normal, similar coloured zip for this dress. Zipping was super smooth though! But, this being a back zip (argh! I really don’t like back zips! ), I couldn’t zip it up myself. Had to get some help. The dress might ride up while walking, and it’s a little on the short side, so, some girls might feel uncomfy about it. I’m a shortie, so i find the length ok, but i probably need to be cautious about the dress riding up. Overall, definitely a dress that’s worth buying! Pretty satisfied with it. I adore the material used for this dress as it is really stretchable. Am also really glad that they didn't use a hidden zip at the back if not I would have hurt my back while trying to zip past the joint. Somehow my dress didn't 'part weirdly' and definitely looks better after I ironed the piece. A great buy and a lovely colour to own!